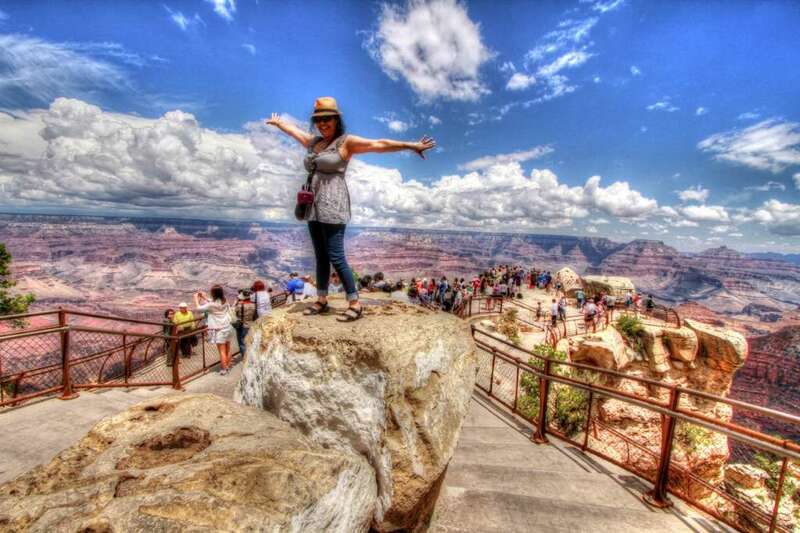 This Grand Canyon South Rim bus tour from Las Vegas is our best selling Grand Canyon bus tour. Enjoy free Wifi and hot lunch buffet on this luxurious tour to the Grand Canyon South Rim. It’s an all-inclusive package that’s loaded with value, so book in advance because seats sell-out fast! Once aboard our state-of-the-art luxury touring bus, the road trip starts. The bus kicks back into high gear as you motor through a beautiful section of Mojave Desert (a convenience stop is included). The remaining leg to the South Rim features a stop in Williams, AZ, for a hot buffet-style lunch at the Depot Cafe and then it’s off to the main entrance of the National Park. The great thing about our tour is that you tour the National Park inside the bus that brought you there – not via the Park’s free shuttle service, which takes away from your sightseeing time. First we’ll make our way to the Grand Canyon Visitor Center, which is nearly adjacent to Mather Point, the most famous lookout at the South Rim. You’ll have plenty of quality time to spend at Mather Point (you can even take a quick stroll to Yavapai Point if you like). From there we go to historic Grand Canyon Village, home to a number of famous lodges like Bright Angel and El Tovar. Strolling the area is a must and you’ll want to make sure to check out Hopi House, Lookout Studio, Verkamps and Kolb Studio. We head back to Las Vegas with a stop in Kingman (food available) at approximately 6:45 p.m where you can stretch your legs, pick up snacks and/or take a smoke break. Expect to be back at your hotel around 10:30 p.m at the latest. Looking back, you’ll agree with other travelers who have been on this Grand Canyon South Rim Bus Tour that it’s one of the finest and most economical ways to see the Grand Canyon. Free hotel pick up and return near Las Vegas Blvd. Free morning snack (pastries) and beverage (coffee, tea, juice). Deluxe luxury tour coach with on-board restroom, TV’s, lounge-style seats, superior climate control, over-sized viewing windows and more. FREE Buffet Lunch (All You Can Eat – $15 value) at the historic Grand Canyon Railway. Vegetarian meals also available. Full 3 hours inside the National Park. Hotel Pickup: is 5:45 AM to 7:00 AM. Tour Length: 15 hours. Expect to be back at your Las Vegas resort hotel between 10:00 PM and 10:30 PM. Our all-inclusive $89.99 South Rim bus tour is the best value in Las Vegas. We will never add a fuel charge, National Park entrance fees, frivolous taxes & booking fees. The price is fixed at $89.99 per person. Not one penny more! 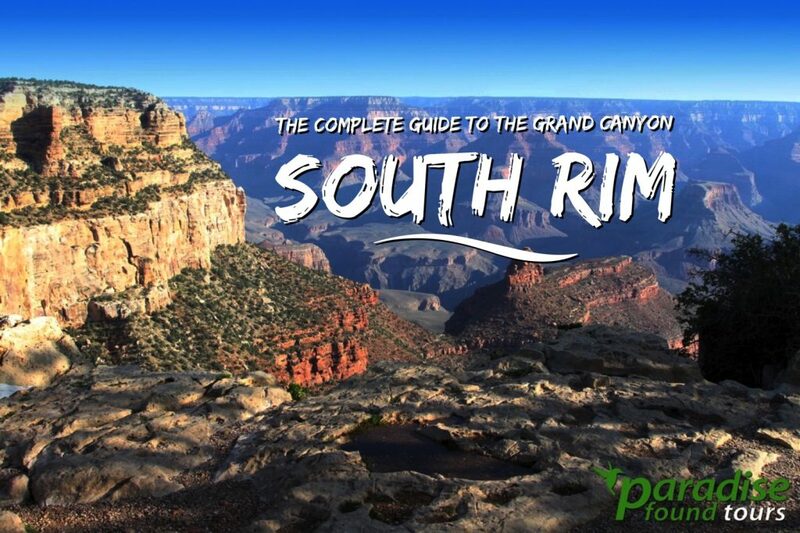 We offer one-way bus trips to the South Rim but you must purchase a full fare, round-trip ticket. You will arrive at Bright Angel Lodge at approximately 12:30 p.m.If you want to stay overnight at the South Rim, you must purchase two roundtrip tickets and meet our bus the next day in front of Bright Angel Lodge at approximately 3:00 p.m. 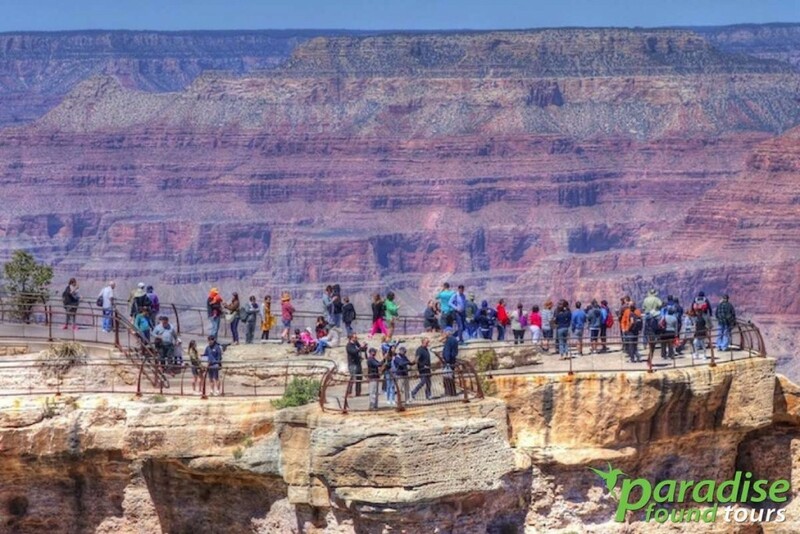 Tourists who've taken the Grand Canyon Airplane tour to the South Rim enjoy the views at Mather Point. This airplane tour is the fastest way to get to the Grand Canyon South Rim in the National Park from Las Vegas. Consider taking this direct airplane tour if you are pressed for time. The flight time is an hour up and back, which is fantastic because it takes nearly 6 hours to drive to the Canyon.